Temple Bar Gallery + Studios is a gallery space for Irish and international artists, also providing studio space to 40 artists a year. 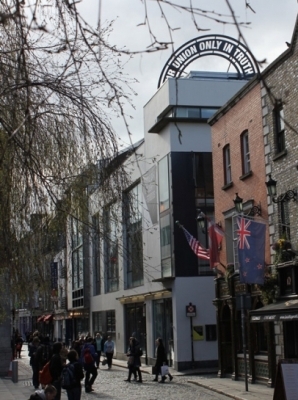 Founded in 1983, TBG+S was instrumental in establishing Temple Bar as a cultural hub in the early 1990s and this year celebrates its 30th Anniversary. 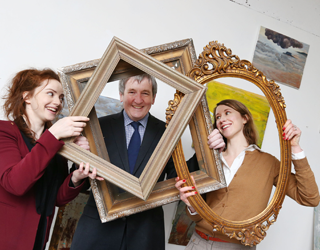 In 2011, Director Claire Power and Programme Curator Rayne Booth took part in the For Impact Training Programme facilitated by Business to Arts. Claire has worked in TBG+S since 2005, and became Director in 2010. Her aim was “to change the management plan of the organisation, and look at forward planning”, and participating in the For Impact training was one way of achieving that aim. An important takeaway for Claire was “refining your message and communicating it in a compelling way”. By simplifying their message, they were able to focus their fundraising activities on the concept of the 30th Anniversary, which has been sponsored by Mason Hayes & Curran. “One of the key messages about Temple Bar Gallery + Studios that we want to get across is about the 30th Anniversary and how the artists in the building over 30 years led to the regeneration of the area”. With this one focus in mind, Mason Hayes & Curran’s sponsorship incorporates an events programme that revolves around this single idea. The programme launched in February with Minister of Arts, Heritage and the Gaeltacht, Mr Jimmy Deenihan opening the event. The programme also involved an art and education programme, and President Michael D Higgins, coming to launch the 30th year commemorative publication. TBG+S approached Mason Hayes and Curran because they feel that “it is an organisation that shares the same ethos for supporting artists and the arts.” TBG+S have also made an effort to create a reciprocal relationship with their sponsor by not only asking for funding but also engaging with the company. The sponsorship has enabled TBG+S to create a new arts and education programme which involves working with primary and secondary schools in the same area as Mason Hayes & Curran. The programme introduces children to Contemporary art, and also involves an exhibition held in the Mason Hayes & Curran building itself. In addition to the sponsorship, Mason Hayes & Curran is supporting TGB+S with their marketing and publicity. By creating a mutually beneficial programme, TBG+S have maximised their relationship with their sponsor. In addition to this particular sponsorship, TBG+S also has secured a silent partner this year, enables a graduate award for young artists. This year, TBG+S launched a large crowdfunding campaign on Fund It for the first time for a commission by artist Garett Phelan. Our Union Only in Truth is a large work located on the roof of the building, commissioned to mark the 30th Anniversary. The objective of crowdfunding the work was not only to fund it, but “a good way to engage one-on-one with people who are willing to support the organisation and to commit to making a piece of art” says Claire, “which was unique for us to do and really rewarding for us as well”. The campaign raised €15,895 through the website. In addition engaging the public, Claire and the staff have focused on engaging prospective sponsors. “A big part of fundraising is going out there and asking people, practicing and refining how you speak about the organisation and how you communicate to people who might not be your usual audience.” Claire feels that it is important to engage with new stakeholders, and understand how the gallery and its mission can relate to different people. Claire has found that bringing prospective partners to the gallery itself has been a fantastic way to get them on board. She believes that “getting out there and making contacts and asking people to come to the building has been the best way of pitching to them”. By bringing people to the space itself, they can engage more in the business and what it does. “What’s really authentic about visiting here is getting in behind the gallery and seeing the artists’ studios,” says Claire. “It’s a hub and it’s a creative community, and so we have been able to show that and share that with different prospective sponsors”. Claire has provided some tips about how to engage potential investors and make an ask. The best way to engage people is to show them what you do, WHERE you do it. In order to maximise relationships, look at who you know and who your contacts might be. When making an ask, practice the pitches that you make, but make then very authentic. When engaging with prospects, communicating the numbers and your story. Get people excited about what you do, and why you do it.